Thread in 'Competition' started by Ai, 6 Jan 2009. I've been participating in as much record threads as possible and I thought it was time to create one myself. I was actually surprised that there was no thread for this mode yet. But then again there has been a TAP Master BIG MODE record thread available for a while now. I shamelessly copied Rosti LFC's TAP Master BIG Mode thread to be honest. Feel free to make suggestions for a better leaderboard format. It wouldn't quite be so annoying that half-steps exist if it wasn't for the fact that every damn block spawns in one. Should I add the score and number of bravos too? Also, feel free to play this mode together with 20G or other modes. I will be adding the leaderboards when someone submits a personal record. Seeing as score is largely irrelevant and without skill, I'd say that level should be the main thing, followed by time. 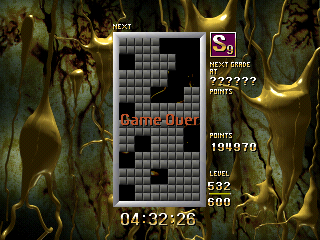 Today's first-try result of the day is S7 at Lv 362 in 3:19.83, died on a misaligned drop. Minor improvement but still no higher grade unfortunately and score is a lot lower than my previous best too. I've also been playing some BIG MODE 20G and this is my best result so far. Something unbelievable happened just now! Nothing special you would say. But the thing is, this is BIG MODE REV!!! WOW am I strange or what (or maybe extremely lucky)?! I think I'll create a new leaderboard seeing as I can't compete in the regular one. LOL!!! Time is so slow because I was trying my hardest to get many bravos. I only got 2. I can only get one bravo per game when I'm lucky. And playing slow doesn't seem to work for me. This mode is really hard. It seems one needs a lot of luck if you're not extremely skilled. I mean I played 100+ games of BIG MODE and getting S6 was a pain to achieve (most games I get around S3). But on the other hand in BIG MODE REV I managed to get S8 within 20 games or so. I might achieve S9 one day, but GM is close to impossible. By the way I've seen BIG MODE 20G GM videos from SAL, but I was wondering if anyone knows of regular BIG MODE GM videos which I would assume is less difficult? I keep killing myself by getting locked in a half-step, and being caught by surprise by the spawns (I'm used to TAP's big mode movement). Thanks! This will keep me trying in 20G. All bravos I get are after clearing triples with the L or J piece and occasionaly doubles with the T-piece. As for half-step misdrops, it happens very rarely now before level 250. And I have yet to play BIG MODE seriously in TAP. I think my best was grade 4 a while ago. Improved my 20G grade. Managed to combo my way back down twice when I was about to top out. Very nice and thanks for bumping this thread. This is what I do when I become mad at myself for misdropping with sonic drop. Play a game without it. Plus this pulls me out from the bottom of the heap. [Edit] New 20G record. Halfway to SAL. Congrats with your S9. It would be awesome if you could get GM! I'll try to close the gap, but first I need to improve my Big Mode S6. Another bump while I'm on my TGM1 binge.